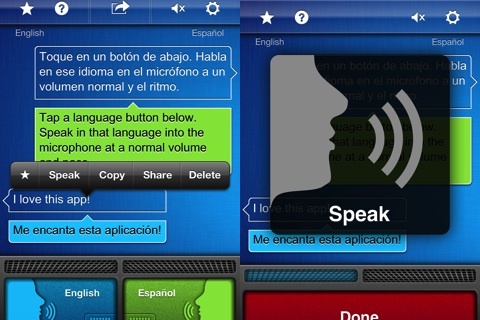 SayHi Translate uses voice recognition software and smart tools for communicating verbally and in writing. The incorporation of useful features and smart functionality in a bright, sophisticated package makes SayHi Translate’s iPhone app stand out from the growing crowd of iOS translation apps. The SayHi Translate’s iPhone app home screen will remind you of the iMessage screen, and many of the gesture controls are similar to those incorporated in iOS devices. The main difference between the SayHi Translate iOS app home screen and iMessage is the striking bright blue color and the menu bars at the top and bottom of the screen. The bottom menu bar has voice recognition and keyboard controls. The top of the screen includes navigation icons to help you access sharing options, help, settings, volume control, and favorites. When you touch the sharing icon, each item of the conversation becomes a bullet point that can be highlighted to share via email and SMS, as well as posted on Twitter and Facebook. That functionality is just like iMessage. If you want to add a conversation to your favorites, you hold your finger on the phrase and several options are presented in a pop-up. You can favorite, speak, share, copy, edit, or delete. The operation of SayHi Translate’s voice recognition software is straightforward. You touch the icon at the bottom of the home screen and begin to speak, or you press the smaller keyboard to manually enter a word for translation. The translation is quickly made, and it is extremely accurate. SayHi Translate’s iOS translation app is simple to use, and its smart incorporation of familiar interface keeps the learning curve at a minimum. This simplicity is a welcome feature, since communicating and traveling in different countries for business and pleasure can be stressful. SayHi Translate’s iPhone, iPod Touch, and iPad app is a minimal investment to transform a potentially challenging situation into a pleasant one. 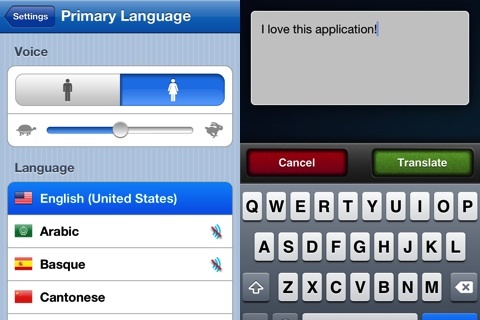 AppSafari review of SayHi Translate: Use Your Voice to Speak a New Language like a Pro was written by Jenni Ward on July 4th, 2012 and categorized under App Store, iPad apps, Universal, Utilities. Page viewed 4040 times, 4 so far today. Need help on using these apps? Please read the Help Page.